Local to international, they are a brilliant part of our work. This has project has been ongoing since 2015 and came to a close in 2018. For the last three years Lochaber Geopark has been a partner in an international project called ‘Drifting Apart’, funded by the European Union Northern Periphery and Arctic Programme. As well as the other Scottish geoparks, North-west Highlands and Shetland, the project included two geoparks in Canada, three in Iceland, two in Northern Ireland, two in Norway and one in Russia. It was managed by the two Northern Ireland geoparks, Causeway Coast and Glens, and Marble Arch Caves. ‘Drifting Apart’ was built around the concept of continental drift, illustrated by the relative movement of the geoparks over geological time, which involved both collisions between and the drifting apart of continents. 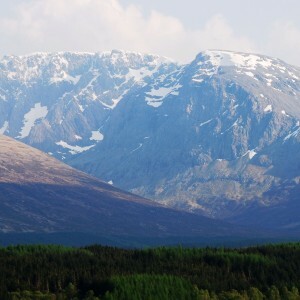 Lochaber’s mountains are mostly built of rocks formed in two collisions, when what was to become northern Scotland was part of the super-continent of Laurentia (modern Canada). The first stage of mountain building (called the Grampian orogeny) occurred around 470 million years ago when the edge of Laurentia collided with a subduction zone in the adjacent ocean, called the Iapetus. In Greek mythology Iapetus was the father of Atlas, who gave his name to the Atlantic. The second stage, at around 430 million years ago, is called the Scandian orogeny. It involved two continental collisions. A small continent, called Avalonia, carrying rocks that now underlie ‘England’, collided with ‘Scotland’ on the edge of Laurentia. The rocks beneath were united for the first time. At the same time a second continent, called Baltica, carrying Norway and western Russia, collided from the East. The long Caledonian mountain ranges of NE Greenland and Norway formed at this time. The rocks of the Highlands north of the Great Glen fault were folded for a second time and moved sideways at least 500 km to the present SE relative to those south of the fault. To the west the Moine Thrust developed, marking the edge of the Caledonian mountains. In Lochaber it passes under the sea, between the Isle of Eigg and the mainland. The British Isles remained part of eastern Canada for another 370 million years, as part of the super-continent of Pangea, as we moved north across the Equator. Sometimes we were desert, sometimes covered by shallow seas, sometimes by tropical forest. Then, only 60 million years ago, the North Atlantic began to open, marked in Lochaber by the volcanoes of Ardnamurchan and Rum, and basalts from the Mull volcano. Atlantic opening continues today and is marked at the surface by the active volcanoes of Iceland. A volcanic eruption in the isandbox! To tell this story we used the Drifting Apart funds in a variety of ways, the most visible being the illuminated wall panels and video displays in our Fort William Visitor Centre. The panels illustrate the evolution of Lochaber over 3-billion years, and the movements of the tectonic plates. A large, scale timeline with representatives of all the main rock types arranged in order of formation, illustrates the mainly northward movement of Scotland over the last billion years. 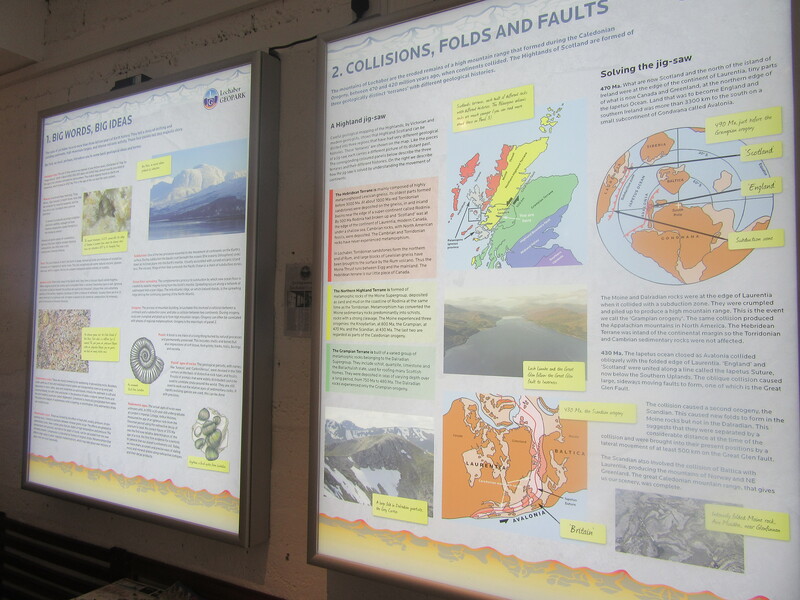 A new ‘fly-through’ display on a large screen (developed in collaboration with the British Geological Survey), concentrates on the mountains of Glen Coe and Ben Nevis and on the Great Glen. It provides an experience like being in a helicopter and explains how the shapes of the mountains are related to the underlying geology and the movements it has experienced over time. 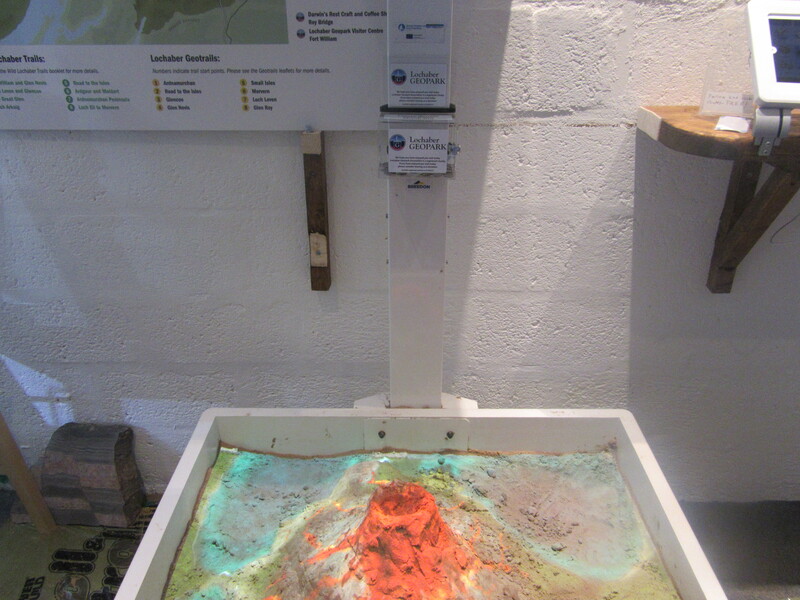 For children we have an augmented reality iSandbox, which allows them to experiment with landforms, virtual lakes and erupting volcanoes, and they have their own wall panel, introducing them to the value of geology and the stories it tells about our planet. 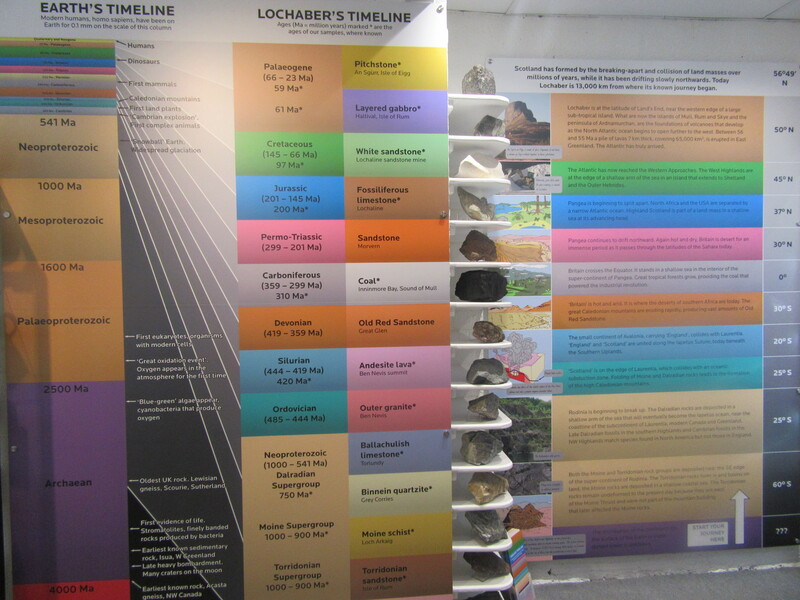 The geological timeline takes pride of place in our Visitor Centre.